I bet you thought that sumo-wrestlers eat and eat and eat all day long…and that is how they gain those pounds to show off those fabulous fighting “uniforms.” On the contrary…what they do is they eat very small, low-calorie meals throughout the day while they train and then they eat a huge meal with most of their calories as their last meal of the day. Wait a second…that kind of sounds like the way most of us eat. Think about it…many of us have a “light” breakfast, a “healthy” lunch, and then dinner is generally our largest meal. Even if you’re not eating the starchy carbs with dinner like pasta, bread and potatoes, chances are, you may be overdoing your intake…even of the healthy stuff. And this doesn’t take in to account what I call the “continuous meal” from those 3pm cravings, to snacking while making dinner and then after-dinner munching. Whenever someone asks me why they can’t seem to lose weight, the first thing I ask them is to tell me what they eat on a typical weekday. I can almost predict it every time. And I’m not even a mind-reader. Here’s a fun way to think about how we should eat during the day…like royalty! Eat LUNCH like a QUEEN. Eat DINNER like a PRINCESS. I challenge you to just try switching up your meals for a week. Eat a bigger breakfast than you typically do, have a satisfying lunch with snacks in between as you need them, and focus primarily on protein and veggies for dinner. Most of us don’t hit that 3pm wall on the weekends…often because we eat a larger, more substantial meals earlier in the day on the weekends than we do during the week (and that work-stress isn’t usually a factor either). I guarantee that you’ll recharge your metabolism, quit having those afternoon cravings that sabotage your plan, and along with increased exercise, those stubborn pounds might just start widdling away without feeling like you have to completely restrict your food intake (this rarely works long-term). 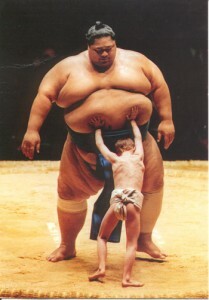 So lesson…don’t eat like a sumo-wrestler!